Sweet Sensation has a number of extraordinary qualities that make it even better value for money. Not only is it juicy and delicious, even in the fruit bowl it remains firm, fresh and succulent for longer than you would expect. 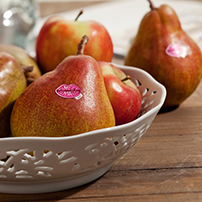 Your fruit bowl even looks more glamorous as the pear’s natural red-and gold richness enhances your home’s natural warmth. 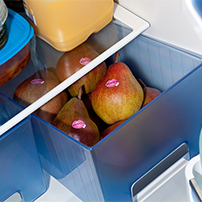 Keep Sweet Sensation in the fridge, the pears stay firm and fresh for longer than you expect. Take your Sweet Sensation out of the fridge the day before you eat it and maximise its fruity freshness. Summer Tip! If you like your pears cool and refreshing, put them back in the fridge for a few hours Then, on a hot day, take a cool bite and you’ll know you’ve found the healthy alternative to an ice cream or cold drink.